At night, a scented fog hangs over the intersection of Le Quang Dinh and Nguyen Binh Khiem streets, in Saigon’s Binh Thanh District. Rush hour traffic disappears into a cloud of smoke; cars turn their hazard lights on to navigate through the grey curtain. I call this the ‘Chicken Mist’: the aromatic haze resulting from a dozen roadside barbecues hissing, smoking and grilling hundreds of fresh chicken carcasses. This is Chicken Corner, and this is where you come to get your poultry fix of crispy, tasty, delicious, grilled chicken in Saigon. 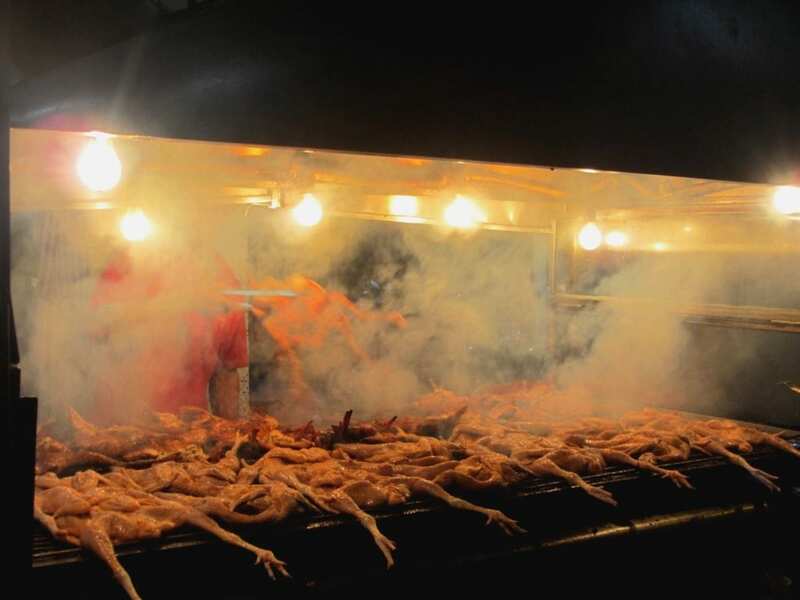 From dusk until around 10 o’clock at night, the BBQ joints on Chicken Corner are a frenzy of fire and smoke. 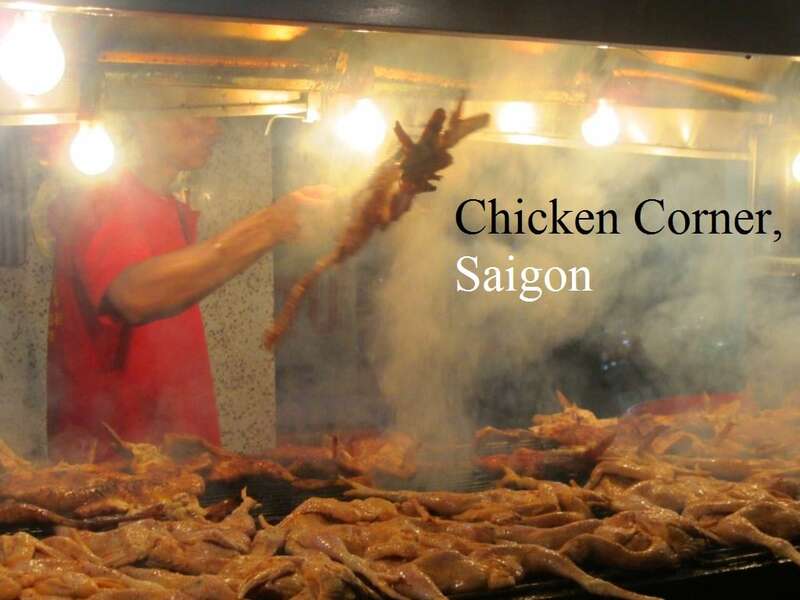 Although there are many pretenders on Chicken Corner, the two big hitters – separated by the entrance to a narrow alleyway – are Gà Nướng Anh Tư and Gà Nướng Lu Việt Hương. Of the two, I favour the former. I used to live very close to Chicken Corner, and the matriarchs at Anh Tư (two large, middle-aged ladies, with big smiles and personalities that reach you from across the street) always welcomed me as if I were their nephew. At Anh Tư they get through over 200 chickens every weekday, and more than 400 a day on weekends. The chickens are grilled on an enormous BBQ on the pavement: a funeral pyre for poultry. Like all fires, there’s something hypnotic and fascinating about watching the flames, and observing the progress of the grilling meat. Come with some friends, take a seat on the plastic chairs, and order up a whole grilled chicken or two to share between you (150,000vnđ [$7] per chicken). They arrive on your table smoking hot and roughly butchered into edible chunks. 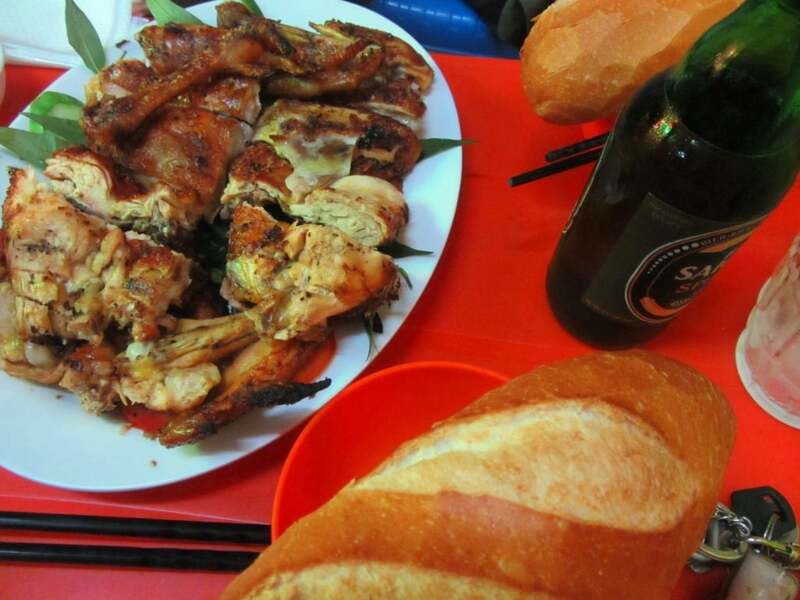 The chicken is served on a bed of sliced cucumber, tomatoes, and Vietnamese coriander leaves, with a couple of loaves of bread on the side. Forget the chopsticks: get down and dirty with your hands instead. There are two dips: chilli, salt and lime (tangy, clean, spicy and fresh) or the house hot sauce, which will burn a hole in the roof of your mouth. If you want the burning to stop, just pop a piece of cool pickled fruit into your mouth to douse the fire. It goes without saying that this meal is accompanied with cold local beer. The chicken is crispy on the outside, soft on the inside, and full of flamed-grilled flavour. The matriarchs at Anh Tư have been running the show since 1996, and they appear to have as much fun as the diners do. This is superb Saigon food: the kind of raw, naked, ‘total’ dining that this city does so well. Get yourself down to Chicken Corner and join in the fun. This entry was posted in ALL, FOOD & DRINK, Meat, Saigon, Street Food, The South and tagged bbq, blog, chicken, grilled, guide, Ho Chi Minh City, Saigon, street food, Vietnam. Bookmark the permalink. I visited this part of town during my first visit to Saigon, and it was indeed absolutely delicious, and very reasonably priced. I have been searching in vain since however for somewhere that will do the same type of chicken in D1 centre. Thus far, I am drawing a blank. Cocorico Bistro is the closest I’ve found, but it’s much more commercial quality. Do you have any ideas? Yes, Chicken Corner is fantastic, but I’ve never found anywhere like it in District 1. A couple of my friends recommended the chicken at Cơm Gà Hải Nam on Calmette Street. Worth a try but nothing compared to Chicken Corner. Thank you once again for the low down on this amazing little piece of Saigon. On your advice, the 3 of us went the Grilled Chicken Corner yesterday arvo. Unsure of which of your two recommendations, we made the only sensible decision in the circumstances, and decided to demolish a chicken at each of Gà Nướng Anh Tư and Gà Nướng Lu Việt Hương. You are so right – they are all both sensational! If we had to be finecky however, we would probably err towards the latter. The chicken seemed that wee bit more succulent. However the light chilli dipping sauce probably had that bit more oomph at Anh Tư. Regardless, you cannot go wrong with either, and at about $7 for a full bird, don’t even consider ordering a half. You will only go back for the second half soon after! It’s a great part of Saigon. We walked back towards the centre of town for a couple of hours, and did not come across a single tourist. The nearby markets at Chợ Bà Chiểu are well worth visiting after your Chicken Corner meal. They seem to be the real deal. Thank you Tom once again. I can’t wait to get back there and order a couple of birds too. Will be checking out this place soon! Just wondering, do they sell half chicken? Mate, went their last night and I feel the need to thank you for one of the most memorable meals of my life. No hyperbole, it was that good. Keep writing the blog, it’s more valuable than any tour guide. That’s great to hear you enjoyed it so much! Thanks for your words of encouragement – I’ll do my best to keep this blog as good as it possibly can be.